﻿ How to Read VitalSource Bookshelf eBooks on a Kindle eReader or Kindle Fire? How to Read VitalSource Bookshelf eBooks on a Kindle eReader or Kindle Fire? Posted by Sisi Liu on 12/6/2018 10:51:36 AM. VitalSource Bookshelf is the most used eTextbook delivery platform in the world of higher education. VitalSource is also the eBook provider of CFA Program Curriculum. Many VitalSource users are the Kindle owners and want to make the most use of their Kindle devices. Is there a feasible solution to read your VitalSource Bookshelf books on a Kindle, you wonder? You’ll get frustrated if you search for the answer on the internet without checking out this article. Here I’m going to introduce how to read your purchased VitalSource Bookshelf books on a Kindle eInk reader and Kindle Fire. Steps of how to take VitalSource books downloaded to PDF files without VitalSource Bookshelf installed will be illustrated. We’re excited to announce that Epubor has finally developed the long-awaited product, Epubor VitalSource Downloader, to help you remove VitalSource Bookshelf DRM and download VitalSource books to PDF files with ease. 1. How to read VitalSource Bookshelf books on a Kindle Fire? 2. How to read VitalSource Bookshelf books on a Kindle eInk Reader? How to read VitalSource Bookshelf books on a Kindle Fire? It’s very simple to access VitalSource on your Kindle Fire as VitalSource Bookshelf is available for the Kindle Fire models of 4th Generation Kindle Fire 7 or later, running Fire OS 5.4.0.1 or later. For the Kindle Fire models not compatible with VitalSource Bookshelf app, you can refer to the 2nd part of the article to download your VitalSource books to PDFs with Epubor VitalSource Downloader and import the PDFs to your Kindle Fire. 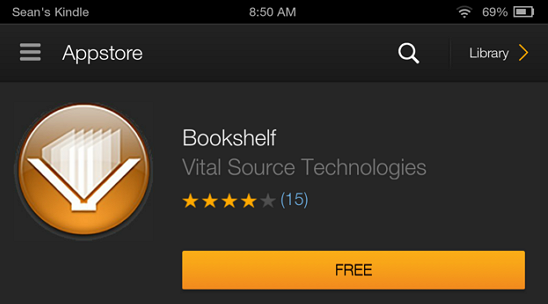 Tap the “Download Bookshelf” button to be taken to the Bookshelf download page in the Amazon App Store. Tap the “Free” button, then tap the Install button. You may be prompted to sign in with your Amazon ID. After that you can enjoy reading your VitalSource Bookshelf books on your Kindle Fire! How to read VitalSource Bookshelf books on a Kindle eInk Reader? As a normal practice, VitalSource Bookshelf will NOT work with any e-ink Kindles or any Nook/Kobo devices. However, with the help of Epubor VitalSource Downloader, you can get your VitalSource books downloaded as DRM-free PDF files which are readable using any device capable of viewing PDF files (assume the original eTextbook delivered by VitalSource is a PDF file). So the VitalSource books are completely at your disposal. It’s up to you on which eInk reader (Kindle/Nook/Kobo) or reading app (Adobe Acrobat/Adobe Digital Editions) to read with. Or you can print these PDFs physically. 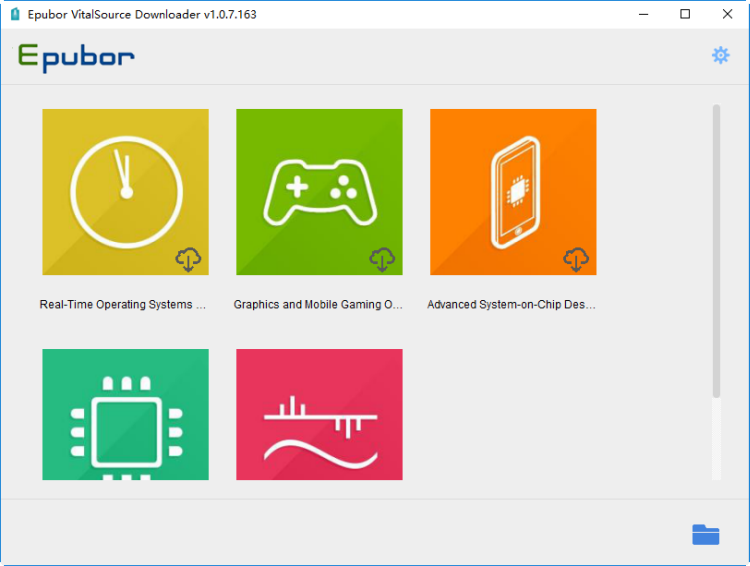 Updated 2/18/2019: Epubor Vitalsource Downloader is not available for downloading any more for force majeure. Step 2. Launch the program, sign in with your VitalSource BookShelf account, and you can see your purchased books are displayed in the library. Step 3. 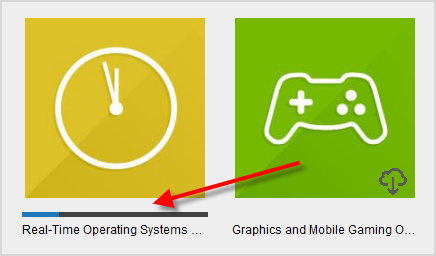 Click on the cover of the book you’d like to download, and it starts to download the book automatically. After downloading the book, it will be saved in PDF file on your computer (on the premise that the original book your purchased from VitalSource is a PDF file). The VitalSource DRM removal and VBK to PDF conversion are processed by the tool simultaneously. A small window indicating “Download file succeeded” will pop up when the books are downloaded successfully by Epubor VitalSource Downloader. Click "OK" on the window, it will redirect you to the location where stores the downloaded DRM-free PDF files. After that you can email these VitalSource PDF files to your Kindle with Amazon’s Send-to-Kindle service or connect your Kindle to computer via USB to add the PDFs to your Kindle eInk Reader. Sisi Liu Sisi is a newbie who joined Epubor in November 2017. She's a bookworm her whole life and has taken great interest in eBooks recently. She learns professional knowledge about ebooks in Epubor and loves to share her know-how to all the ebook lovers! Re:How to Read VitalSource Bookshelf eBooks on a Kindle/Kindle Fire? does not work. does nothing at all. What does you mean does not work? Can you please describe your problem more clearly so that we can help you fix your problem? Also, you can contact our customer service: support@epubor.com and write down your issue. This worked great for me. After installing it, you launch from a shortcut on your desktop. Then you select "free trial" to log in. You'll have to remember your email and password for your Vital Source account. Depending on what type file your books download as, you may have to use an Epub to Mobi converter. Okay, so trial version only gives you the first 5 pages. You have to pay for it to actually work. Thank you for using Epubor software. The trial version will allow you download 5 pages of each book but the licensed version will give you the full content with 1 click. Now that the VitalSource Bookshelf software is non-functional, what's your suggestions for converting these eBooks. I have ecudor ultimate, no luck there. Thank you for using epubor software. We are sorry to inform you that there is no other software can convert vitalsource to pdf for now. We are sincerely sorry for the inconvenience caused. Home > Guide >How to Read VitalSource Bookshelf eBooks on a Kindle/Kindle Fire?